Roulette Tips: Learn about High-Risk and Low-Risk Bets and More! Roulette is one of the most entertaining games you can play online or in a brick-and-mortar casino! It brings people who’ve never gambled before together with individuals who’ve been enjoying the game for decades. Roulette also attracts every type of gambler around, from those who love to shoot for high returns to those who prefer to make comparatively safe bets. The real reason that roulette is so exciting, though, is that it is a game that depends entirely on luck. You don’t need to master strategy or learn complex mathematical formulas to play. All you need to do is show up with some money and place a bet! American and European roulette are the two most common variants of the game. American and European roulette wheels are the same except for the fact that American wheels have a 00 slot while European ones do not. While this might seem insignificant, it isn’t. The 00 slot on an American wheel decreases the amount you stand to win by more than 2.5%. So, if you have the choice between playing American and European roulette, head straight for the European tables. No matter what kind of roulette you decide to play, the point of the game will be the same. Your goal is to place a bet on the table that accurately predicts where the ball that is spun will land on the wheel. If you are correct, you win. If you’re wrong, you lose. Your table’s croupier (roulette’s equivalent to a blackjack dealer) is responsible for spinning the ball on the wheel. If you are playing online, you will need to place your bets before the ball is spun (you act as the croupier online and initiate spins by hitting the button labeled, “Spin”). If you are playing in a physical casino, you can continue to place bets after your table’s croupier spins the ball. The croupier will signal when bets are no longer allowed after each spin; this will occur well before the ball settles into one of the wheel’s slots. 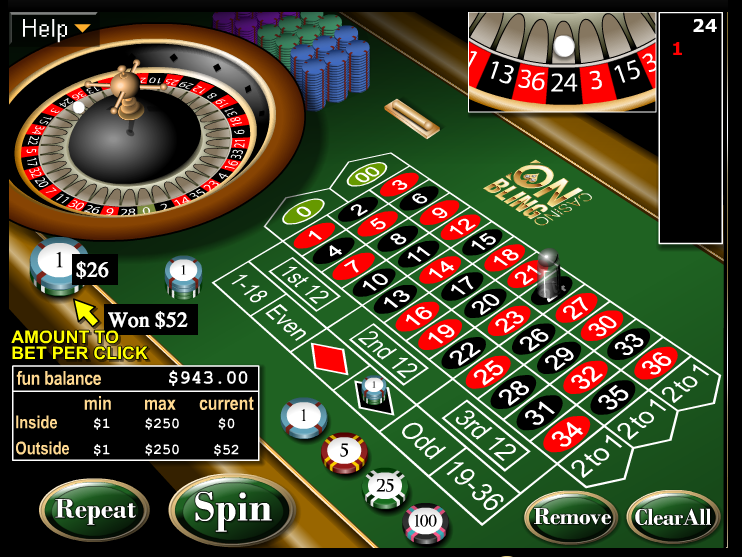 As you can see from the picture of Onbling.me’s virtual roulette table below, there are many ways to bet in roulette. Before you panic, just know that how you bet as a beginner is not contingent upon you knowing each and every way you can place a bet. Instead, it’s simply driven by the size of your bankroll and how much risk you are willing to take. When you place wagers on the inside of a roulette table, they are considered to be high-risk because you don’t have as many ways to win compared to those who place bets on the fringe of the table. Because of their high-risk, bets made on the inside of the table pay out more than those made on the outside. If you place a bet on a single red or black number and the ball lands in the corresponding slot on the wheel, your bet will payout at a rate of 35:1. If you bet on two adjacent numbers with the same chip by placing the chip on the line that separates the numerals and hit either of them, you’ll enjoy a 17:1 payout. As you can see in the picture of Onbling Casino’s roulette table above, outside bets are outlined in white and border the inside of the betting table. As we’ve discussed, you will not get paid as much on a low-risk bet as you would if you won on a high-risk bet, but you do have a better chance of winning with an outside bet than you do with an inside bet at a roulette table. Depending on the type of low-risk bet you make, your payout will either be 1:1 or 1:2 if you win. Now that you know the basics of the game, we highly recommend Onbling Casino. For some reason, most online casinos don’t like offering roulette bonuses to players. So it can be very difficult for US players to find a bonus to clear by playing roulette. That being said, Onbling comes to the rescue here offering new players up to $4,500 in roulette bonuses! If you want to play roulette online, visit Onbling Casino today and try out some of the best roulette tables anywhere! Don’t be nervous, just keep these tips handy and refer to them when you need to! If have any questions that aren’t answered here, contact Onbling’s customer service department using the casino’s live chat feature, or email (support@onbling.com). Onbling’s friendly, knowledgeable customer service reps are available 24/7 and they’re always happy to help out! For even more information, read our Onbling Casino review. Now that you know the basics of the game, we highly recommend Party Casino. For some reason, most online casinos don’t like offering roulette bonuses to players. So it can be very difficult for to find a bonus to clear by playing roulette. That being said, Party comes to the rescue here offering new players up to $250 in roulette bonuses! If you want to play roulette online, visit Party Casino today and try out some of the best roulette tables anywhere! Don’t be nervous, just keep these tips handy and refer to them when you need to!